Experience the so-called Silk Island Koh Dach in the middle of the mighty Mekong river. 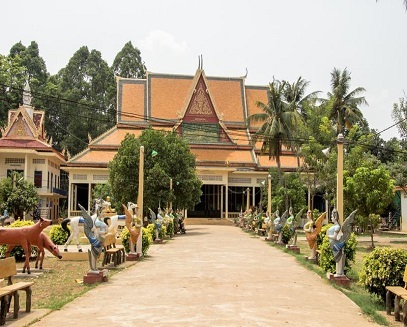 Located just a few kilometres upstream from the bustling Phnom Penh, travelling up the river at the slow-paced countryside lifestyle by bike or tukt-uk makes for a unique and interesting activity. From the city center to the island, the landscape and views quickly change from an energetic city to the countryside life with farms, wooden houses and small pagodas. This roughly 7-kilometer long island offers the unique chance to experience the local life up-close, get a glimpse of traditional silk-weaving techniques, and witness the cultivation of the land. The highlight of the journey will be the lunch stop at a local house. Here, a lovely family will prepare a delicious local meal.